Aviation is working to reduce the exposure of the population to aircraft noise. Due to quieter engines, innovative aircraft technologies and optimized approach and takeoff procedures, aircraft have become quieter and quieter. The aviation industry is focusing on reducing noise caused by aircraft (active noise abatement) on the one hand and on relieving local residents (passive noise abatement) on the other, by financing, for example, structural noise mitigation. Further options for control of aircraft noise are efficient traffic control and optimized flight procedures. This includes continuous descent and satellite-based approach procedures. Noise-related airport charges are another component: the louder the plane, the higher the charges at the airports. This can be an incentive to deploy quieter aircraft. It is also important to create transparency in the debate on aircraft noise. This is achieved by informing citizens at an early stage, by improving complaint management and by involving delegates in the aircraft noise commissions. Many airports publish data from noise measurements and measuring stations on their own websites. The most effective way to protect local residents is to replace old, noisy aircraft with modern, quieter aircraft or to retrofit engines, wings or landing gear in the existing fleet. Each new generation of aircraft is significantly quieter than its predecessor. 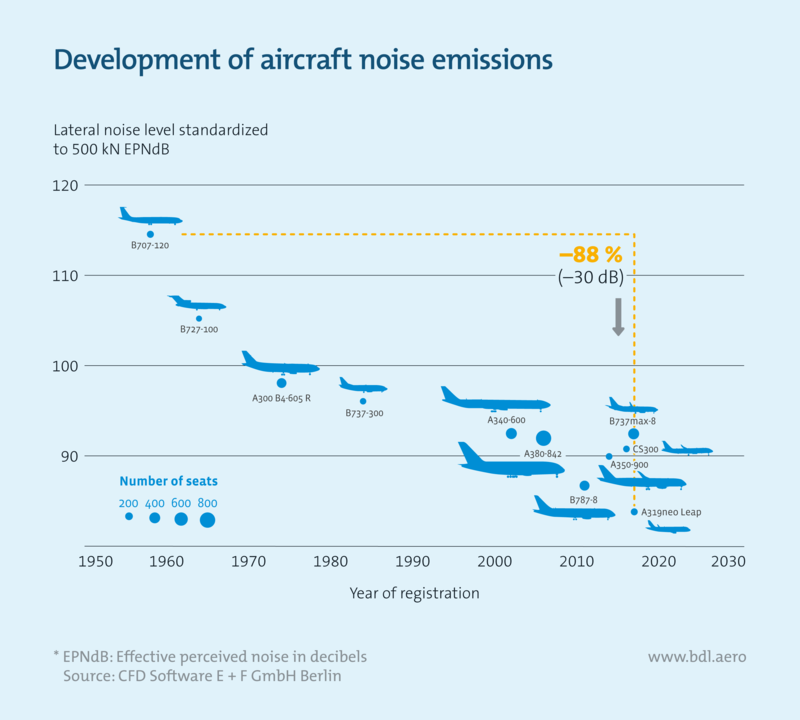 The noise produced by an aircraft has been reduced by 88 percent or 30 dB over the past six decades. Replacing an A320 with a new, quieter A320neo, for example, halves the noise at takeoff. A lot is also being done on the ground to reduce noise emissions. The use of ground power units at airports and the provision of air-conditioned air prevents aircraft from having to run their auxiliary power units while parked. In addition, there are alternative options for ground traffic. Aircraft tractors are used to reduce noise emissions from engines, which are switched on as late as possible. If local residents are nevertheless affected by aircraft noise, they have been able to claim for structural measures such as soundproof windows for years. This is another important approach to reducing noise pollution and thus protecting the population, which has long been practiced by the aviation industry. By 2016, airports and airlines had spent €1.12 billion on noise abatement. 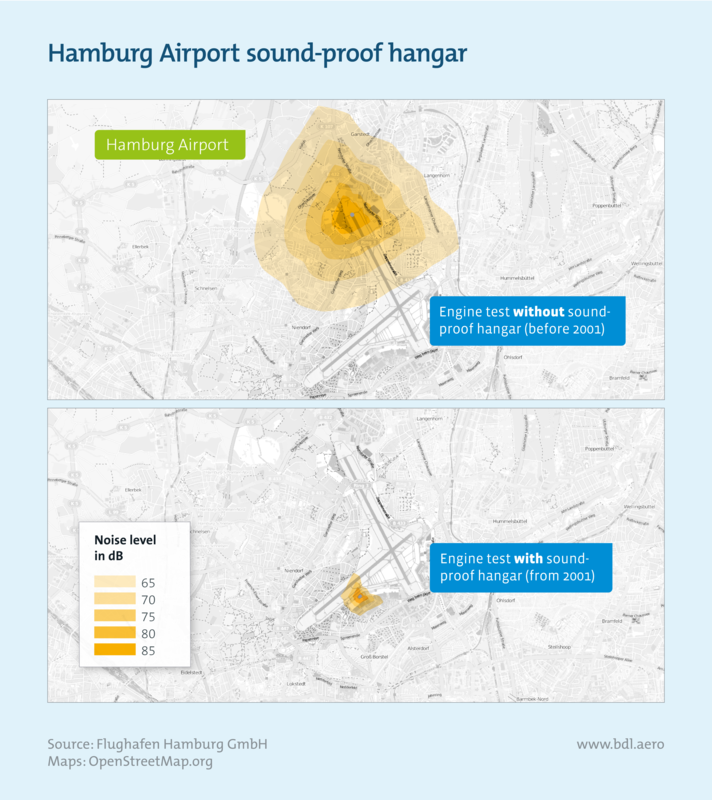 Sound-proof hangars for engine tests on the ground also protect residents from noise. In this context, however, a responsible settlement policy in the vicinity of airports is also necessary in order not to increase the number of people affected by aircraft noise. Among other things, a settlement restriction in the immediate vicinity of airports could help prevent even more people from being affected. Although aircraft are becoming quieter and quieter and numerous measures are being taken to protect local residents from aircraft noise, the number of complaints about aircraft noise has increased in recent years. However, more and more individual complainants are submitting thousands of automatically generated complaints, thereby distorting the picture of actual noise exposure. Since 2007, the German Federal Environment Agency has been recording every five years how many people in Germany are actually affected by traffic noise. According to the August 2018 evaluation, 8.7 million people in Germany are affected by street noise and 6.4 million by rail noise. Aircraft noise affects by far the smallest proportion of the population at 0.8 million people. The basis for these figures – as for all modes of transport – is a permanent sound level of more than 55 dB(A). 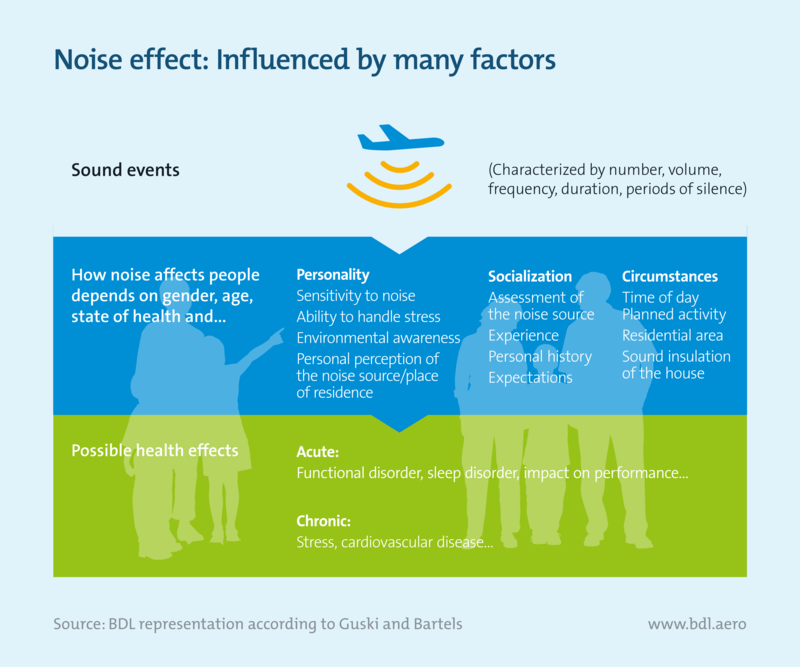 This means that a total of 19 times more people are affected by street and rail noise than by aircraft noise. Considering the numbers of people affected by noise at night and an even lower permanent sound level of 50 dB(A) for this period under consideration, the Federal Environment Agency figures show that the differences are even more pronounced: between 10 p.m. and 6 a.m., 23 times more people are disturbed by street noise and 21 times more by rail noise than by aircraft noise. 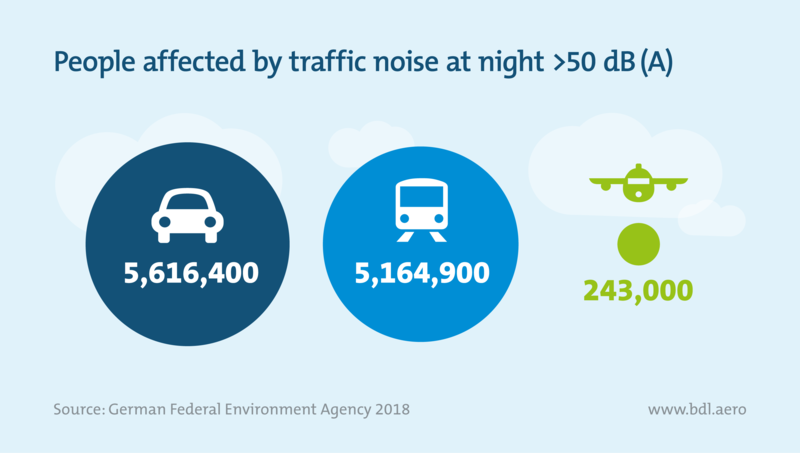 At night, a total of 5.6 million people are affected by street noise, 5.2 million by rail noise and 0.2 million by aircraft noise. There are also differences in the numbers of “highly affected” persons, who are exposed to a permanent sound level of more than 70 dB(A) from midnight to midnight: these are 697,500 people by street noise, 324,200 by rail noise and 3,700 by aircraft noise. While the objectively measurable exposure to aircraft noise is decreasing, the number of people who feel subjectively annoyed by aircraft noise is increasing. Because people perceive the same sounds very differently, individually, what is comfortable for one person can be unacceptable noise for another. In addition to the measurable volume, the attitude of the listener toward what is being heard plays a role in the evaluation. In this respect, sounds can affect the people’s subjective perception simply by disturbing them – which can cause stress. Even at an intensity that does not affect health, sound can trigger physical stress reactions. These can also occur during sleep. 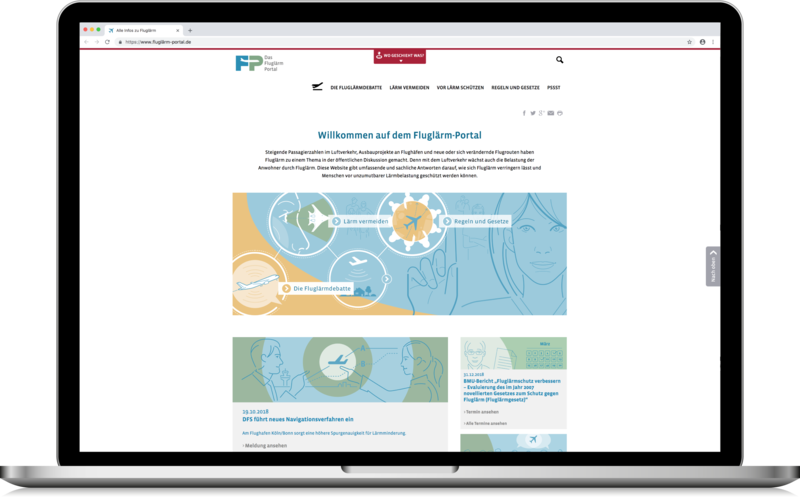 The latest news as well as many facts and charts on the subject of aircraft noise are available at the knowledge portal www.fluglärm-portal.de.